1. We sold our house on Christmas Eve. 2. We’ve spent way too many hours desperately seeking new digs and going back and forth on major decisions. 3. Like many others, we did some traveling over the holidays to see our family. 4. I started a new semester, which means new classes, new students, and new lesson planning adventures. 5. My talented hubby started a great new job: a huge blessing, but new jobs always involve a touch of a learning curve and a lot of extra hours required to get started on the right foot. 6. We have to be out of our current house in less than two weeks. Whew! These events have all been incredible blessings, but they have all come with a certain amount of stress and general craziness. Needless to say, we’ve been praying for a lot of wisdom in making better decisions lately. 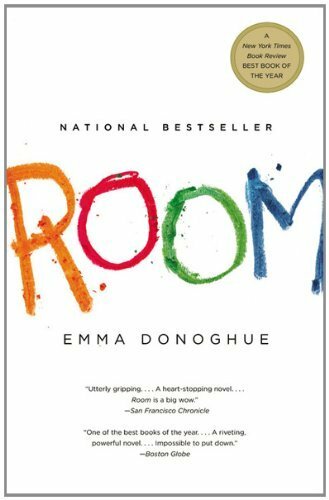 I did manage to read Emma Donoghue’s Room over the Christmas break, however, and talk about putting things in perspective. So enough about me – let’s get to the review! Room is tough to read but also ridiculously hard to put down (seriously – after my wonderful, thoughtful mother gifted me with this book – however did she know? – I read it in about two days. Imagine how much I could read if every day were Christmas break! ;)) It’s completely told from 5 year old Jack’s perspective, and all he has ever known is the inside of a shed-turned-house-of-horrors where Jack’s mother has been kidnapped and raped for more than half a decade. Jack is the product of this nightmare, but his Ma has been able to love him and shelter him by putting him to bed in a chest of drawers every night so that he never sees the monster’s face. I was concerned that this would read as way too gruesome and voyeuristic, but since Jack is the narrator, his innocence and soft heart shields the reader from too much trauma (although Donoghue does a solid job of filtering information through him in a way that her adult readers know exactly what is going on). Following his development and gaining insight into his psychology is altogether fascinating. What I didn’t anticipate was that half of the book takes place when Jack has made it out of Room and is painfully adjusting to the world (I don’t think this qualifies as a “spoiler” as he is the narrator, so, dear readers, you can reasonably bet on the fact that he does in fact survive this nightmare). In many ways, the real world is far more terrifying this his routine in Room, where his Ma did a phenomenal and emotionally moving job of trying to normalize his existence, shield him from anguish, and give him every opportunity to develop like any other child. In fact, the small details of Ma and Jack’s day-to-day existence in Room and Jack’s transition from Room is where the book shines. To break down such a traumatic life most only know from the headlines into a realistic, routine experience is the most skillful part of the narrative to me. And while some parts of the book might read a little slower, Jack’s escape is one of the most exciting, heartbreaking, and nail-biting sections of a novel that I’ve ever read. Some parts of the book are definitely uncomfortable to read, and I wouldn’t necessarily recommend this for a “fun” read. However, as serious as the subject is, Donoghue still manages to infuse hope throughout the book, and it is a book that will make a lasting impression. If you’ve ever been emotionally involved or interested in the Elizabeth Smart (who I’m always thrilled to see so happy), Shawn Hornbeck, or Jaycee Dugard cases and admired their strength when their kidnappers were caught and persecuted, then this novel is certainly for you. While there are obvious comparisons to be made to these famous kidnappings/rescues, Room is its own story, and you will root for the confused yet courageous five year old narrator all the way through.